. Along with launching the Google Analytics Application Gallery and making the new, faster page tag the default, we released a major update of the AdWords reports in Google Analytics. As of today, all Analytics users now have access to the new AdWords reports. With this update, you have access to three new reports, 10 new dimensions, and more AdWords metrics. Three new reports give you the ability to dig into all aspects of your AdWords campaign performance. Click any photo to enlarge. Curious to know the best day of the week for your ads or the best hours of the day for your campaigns? See your ad performance broken down by day of the week and by hour of the day using the Day Parts report. The Day Parts report can help you find the most profitable times of day for your ads. Then pair it with the Ad Scheduling feature in AdWords to automatically adjust your bid to capture the right traffic at the right time. What are your best landing pages? The Destination URLs report lets you dive into the performance of each of your Destination URLs. You can break out performance at the Campaign, Ad Group, or Keyword level. Apply a secondary dimension like Keywords and see your top Destination URL/Keyword pairs. The Placement Performance Report in AdWords shows you the performance of your ads on the Google Content Network. With the Placements Report in Google Analytics, you can get rich post-click performance data about your campaigns and find the best sites to target your ads. Or, either exclude the sites that don’t send you engaged traffic or identify the top performers to create a targeted display campaign. Dive deep into your AdWords performance using 10 new AdWords dimensions. For example, try Match Type to see performance between Broad, Phrase, and Exact Match. Love the search query report in AdWords? Segment by Matched Search Query to see exact user queries that triggered your ads and post-click performance. The Clicks tab brings your AdWords performance metrics into Google Analytics. From the Clicks tab you can get an overview of AdWords performance at the Campaign, Ad Group, or Keyword level. Combined with Goals or eCommerce tracking you can see a complete picture of your AdWords performance. To start using the new AdWords reports in Google Analytics you need a linked AdWords account. You also need to make sure that Destination URL auto-tagging is turned on. Start from your AdWords account, select the Reporting tab, then Google Analytics. 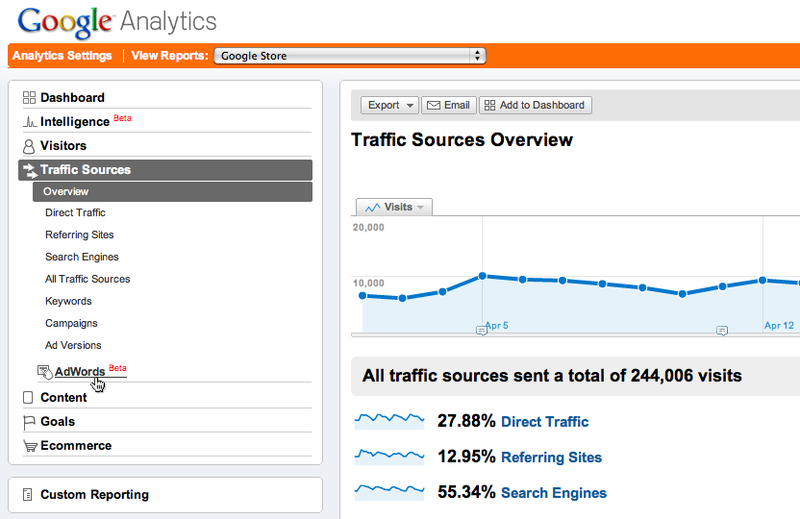 To access the reports from Google Analytics, select Traffic Sources, then AdWords. Hope you enjoy the new reports! Let us know what you think in the comments. 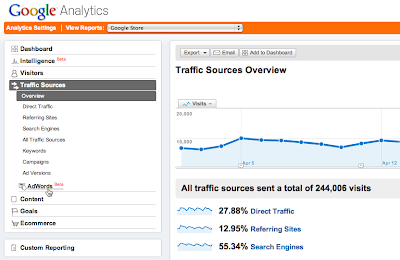 Last month, we made a number of announcements around the Google Analytics ecosystem. Along with launching the Google Analytics Application Gallery and making the new, faster page tag the default, we released a major update of the AdWords reports in Google Analytics. As of today, all Analytics users now have access to the new AdWords reports. With this update, you have access to three new reports, 10 new dimensions, and more AdWords metrics.